Though the name of the group that sponsored this space – All For One Youth Mentoring, which aims to divert at-risk young people from gang activity by getting them involved in community work and outdoors activities – appeared above the Zapata portrait, one had to wonder if the people giving out the compliments were doing it specifically to encourage reforming gang members or merely to express their gratitude for a well-executed work of art. All For One mentor Anthony Prieto said it was the latter. “No, they don’t know what we do or what All For One is,” he said, without the slightest hint of resentment. It’s clear that for Prieto, satisfaction comes from results – in the lives of program alums who now have wives, children and jobs as well as more tangible things, like the I Madonnari entry. Perhaps more people should know about All for One, however. Under various names, including “Hoods in the Woods,” the program has been showing teens and young men throughout the 805 area code that they need not rely on gangs in order to get by. Among the various activities in which the group involves its participating youth are treks out to the wilderness. East Side, West Side and Goleta gang members alike spend days together, putting aside local tensions and interacting with each other as people, not residents of a particular territory. Most recently, about 50 of these reforming gang members spent a few days in Mammoth. All for One Program Director Vincent Castro – 20, a student a Santa Barbara City College and himself someone whose life was redirected by the program – said the outing went well, with gang tensions stemming from violence in the past year subsiding. All 4 One artist Brian Garcia puts the finishing touches as the crowd looks on. “We’re not saying ‘Don’t do this.’ These guys have been told what not to do all their life,” Prieto said, explaining that All For One simply provides an alternative and has gang members interact with mentors who have also ended their gang affiliations and therefore understand the dilemmas these young men face. “This lifestyle is everything to them,” he said of gang mentality. 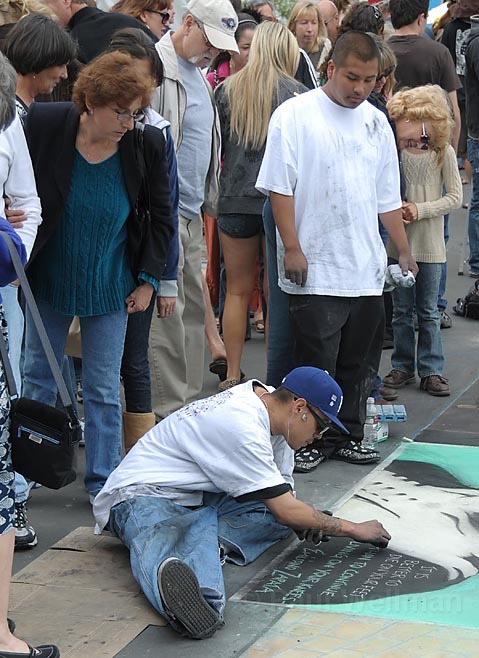 Events like this year’s I Madonnari get reforming gangbangers “exposed to people they wouldn’t meet otherwise.” Indeed it did. A happy consequence of the Average Joes not understanding what All For One does is that people seeing the art would have perceived Garcia and Rios as members of the community working along side artists, religious and all other sorts that turned out – not gang members or people in the process of distancing themselves from gangs. Garcia and Rios quietly accepted compliments from passersby, sometimes needing a prompt from Prieto to say thanks. 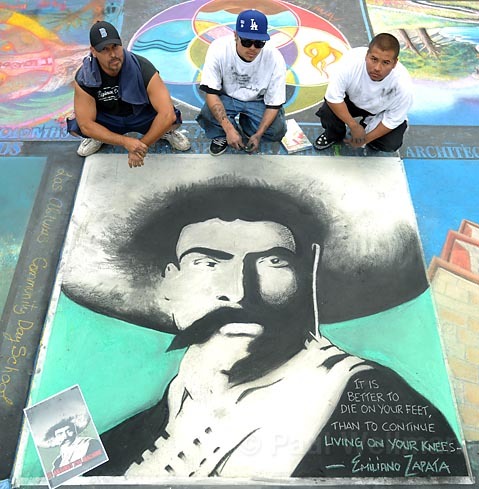 Both young men hail from the West Side, and though the intention was to also have East Side residents involved in this year’s effort, only Garcia and Rios showed up to drag the chalk across the pavement. Childhood friends, they first became involved with All For One when Garcia was ordered to do so by a court several years ago. Garcia later convinced Rios to join in as well. Though neither claimed to have any sort of training with chalk as an artistic medium, it didn’t show. Their work looked as good as any other on display – a feat, especially considering that pastel chalk is not the most forgiving medium to work with. All 4 One previously worked on a different portrait of Zapata for the 2006 I Madonnari. Prieto picked Zapata as the subject for both years because he said he stands as a role model, not for having engaged in violence but for having stood up for what he felt was right. The finishing touch on the work was a quote attributed to Zapata: “It is better to die on your feet than to continue living on your knees.” The quote can be read a number of ways, but it’s clear how All For One is interpreting it – as a justification for making the hard choice of leaving behind gang life and forging ahead as an independent adult.